Sweet Potato Chess Pie Recipe- A fun holiday twist on a classic Southern pie using Land O Lakes® Butter. 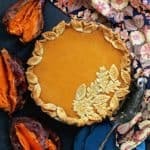 This is a great way to jazz up both chess pie and sweet potato pie renditions for the holidays! Beat butter and sugar together on high until light and fluffy (about 4-5 minutes). Add eggs one at a time and mix together until well incorporated. Next add cornmeal, flour, cinnamon, vinegar and vanilla and finally slowly add mashed sweet potatoes into batter and beat until completely smooth. Pour batter into prepared pie shell and bake for 45-50 minutes.